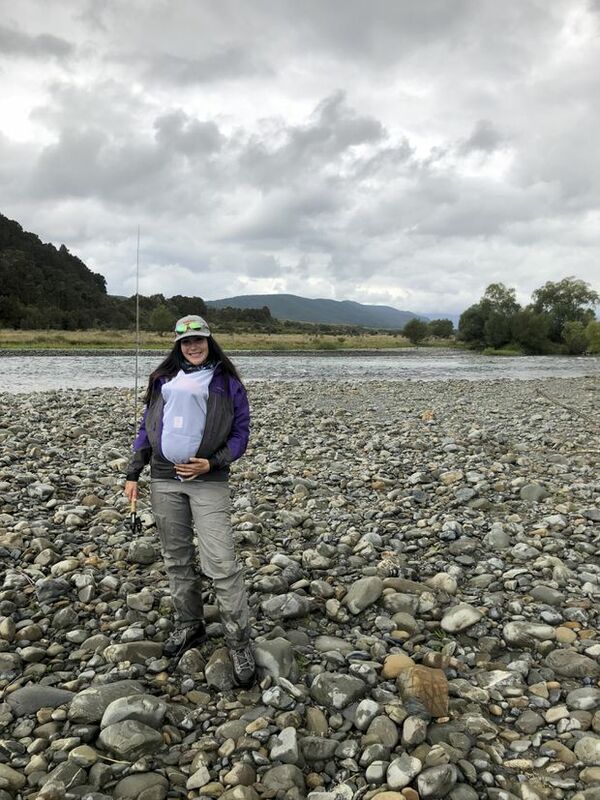 April Vokey casts while carrying her daughter Adelaide on a river on New Zealand’s South Island. I’ve been trying to think like a fish. Like a trout, specifically. What would be appetizing to a trout this afternoon? And where in this river, if I were a trout, would I want to position myself? And finally, after a six-hour drive to a remote spot in the wilderness, a change into my waders and an hour spent trekking up and down the river trying to find fishy water, the fish are biting. However, my seven-month-old daughter doesn’t appreciate that the trout are starting to rise. She’s hungry and it’s time for me to feed her. I reel in my line and carefully walk through the water back to the riverbed to rest my rod, take off my pack, peel down my waders and undo my shirt. I take my little girl from the arms of my husband, who’s walked with her down from the cabin to find me. It’s breastfeeding time. Women are the fastest growing demographic in fly fishing and considered vital to the sport’s continued existence. As anglers across North America ready their flies for early summer hatches, outfitters and guides are thinking of women – how to make gear for them; how to attract them to the sport and how to make them comfortable in a domain that was for so long the realm of men. According to a New York Times article last year, women are the only growing demographic in fly fishing, which is why industry leaders are so keen to cultivate their participation in the sport. Accurate figures on the number of fly fishermen in Canada are not known as Fisheries and Oceans Canada is still working with Statistics Canada to finalize the results of a 2015 survey. (They anticipate releasing these figures in the fall.) South of the border, women make up 31 per cent of the 6.5 million Americans who fly fish, according to the Recreational Boating & Fishing Foundation. In 2016, more than two million women participated in the sport, an increase of about 142,000 from the previous year. But one stage of a woman’s life is, ostensibly, at odds with fly fishing: motherhood. For female anglers who become moms, early motherhood is a phase that is neither fleeting nor possible to overlook; pregnancy and at least the first few years of motherhood span several disrupted fly-fishing seasons. There is no data on the number of mothers who fly fish. We are a small sub group who connect through social-media hashtags and word of mouth in the close-knit fly-fishing community. But anecdotally, and logically – as more women enter the sport – our numbers are on the rise. For mothers, pregnancy and babies can potentially turn an insouciant time on the water into an anxiety-inducing, joyless excursion. So just how compatible is motherhood with fly fishing? What motivates women to overcome the many challenges to persevere? And what can companies that have made women the target of their growth strategies learn from what moms have to say? 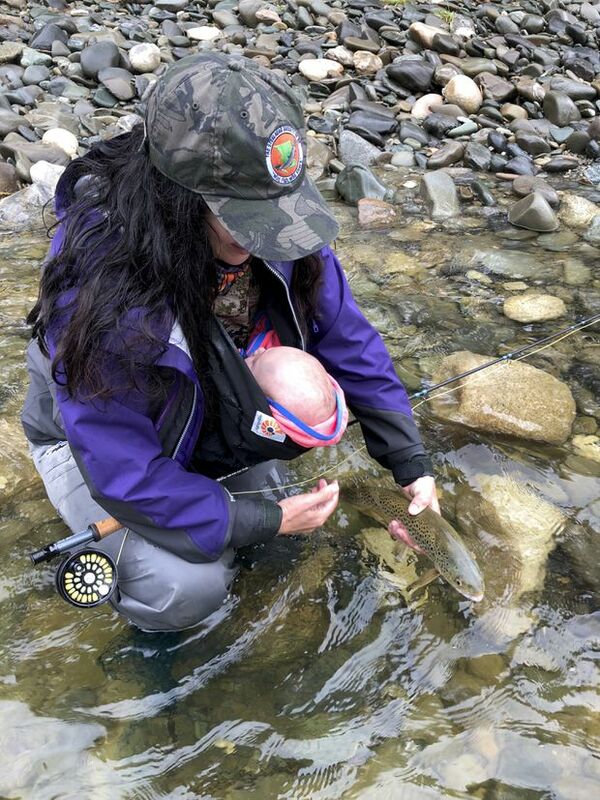 April Vokey knows what it is to have a baby and keep fly fishing. The renowned angler is owner of Fly Gal Ventures and the woman behind the podcast, Anchored with April Vokey, which has more than four million downloads. April and Adelaide net a trout. She’s also mom to seven-month-old daughter, Adelaide. On the spectrum of unflappable and outdoorsy through to anxious and desk-bound, Vokey sits undaunted at the former end. The 34-year-old hunted, fished and camped until she was 8½-months pregnant. Within two weeks of being discharged from hospital with her newborn, she was back at it. Jamie Walter is another of the small sub-group of fly-fishing mothers. And she’s another of those hardy, unruffled types. The 30-year-old is based in Colorado and is a few years further into the motherhood journey. She has a four-year-old son, Breken, who appears occasionally in Walter’s Instagram posts to her 22,000 followers. When Breken was born, Walter didn’t know anyone else who fly fished with a baby. “I did anticipate some challenges but didn’t know exactly what I was in for,” she reflects. 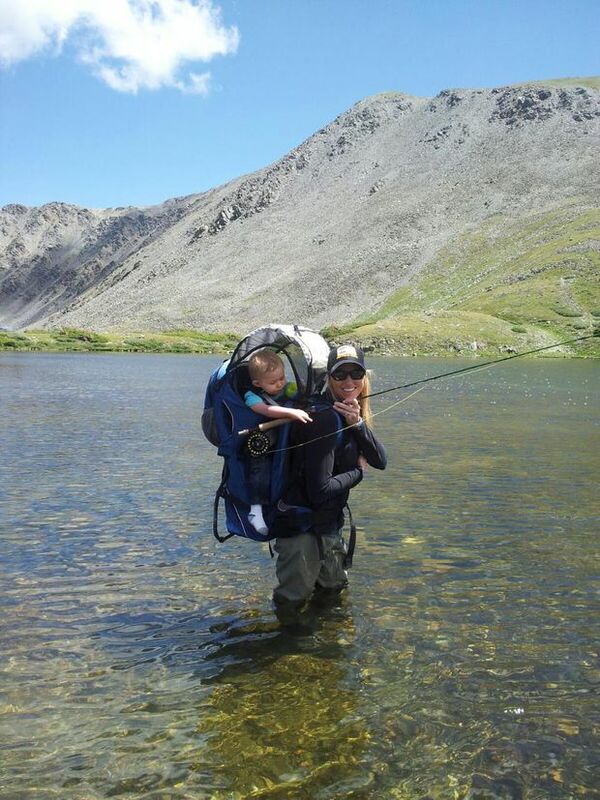 Jamie Walter fishes with her son Breken in Colorado. “I think the hardest part for me is not being able to just fish. When it was just me at the river, I would fish and fish and fish until I was done for the day. With a baby, it’s a stop-and-start process. Baby needs this, baby wants that. Baby needs a diaper, baby wants to play. “The best advice I got was from a friend. I wanted to go fishing but didn’t have anyone to watch my son. She told me to ‘take him with you’ and I did. Now, he goes on 95 per cent of my fishing adventures with me. With no one to turn to for advice, Walter learned through trial and error. She quickly realized she would have to adapt and keep her fishing expectations low. For fly-fishing moms, the sport offers few domestic conveniences that make motherhood more manageable. And it means, as well as fishing, concentrating on keeping you and your baby safe, warm and fed in the wilderness. It also means the quietude of just you and the river is interrupted. Babies aren’t stealthy or quiet. So with splashing and making noise not conducive to catching fish, what do you actually do with a baby when you’re fly fishing? The short answer is you either carry the child on your back or the front of your body, taking care to shield her or him from the elements, bugs and hooks and trying to keep grabby hands away from the wispy, impossibly thin fishing line known as the tippet. The best advice I got was from a friend. I wanted to go fishing but didn’t have anyone to watch my son. She told me to ‘take him with you’ and I did. But nursing presents a different challenge. The day of a mom who breastfeeds is broken down into three-hour (or so) segments. If she doesn’t nurse or express milk regularly, her breasts become uncomfortable and engorged and she risks reducing her supply and contracting mastitis. It means that mom and bub have to stay close, and in a sport that takes people to wild locations, it means the baby, at least for the first few months, can’t remain safe and warm at a cabin. They’re on the water with mom. So while breastfeeding a baby simplifies feeding, it leads to other challenges that come with being in remote locations. Remote locations don’t lend themselves to babies. If something goes wrong, cellphone coverage can be patchy or non-existent. Medical help is hours away. There are no conveniences, so everything you might need has to be packed and taken with you. Nature is beautiful but it’s a bother to a new-mom fly fisherman. From a safety perspective, rushing water, drowning hazards and hooks all pose problems. Wild locations can also mean wild and dangerous animals. So in reality, for that new mom, it means fishing with someone who can stay in a nearby cabin or on the riverbank to look after the baby. And it means curtailing plans for long days spent on the water. 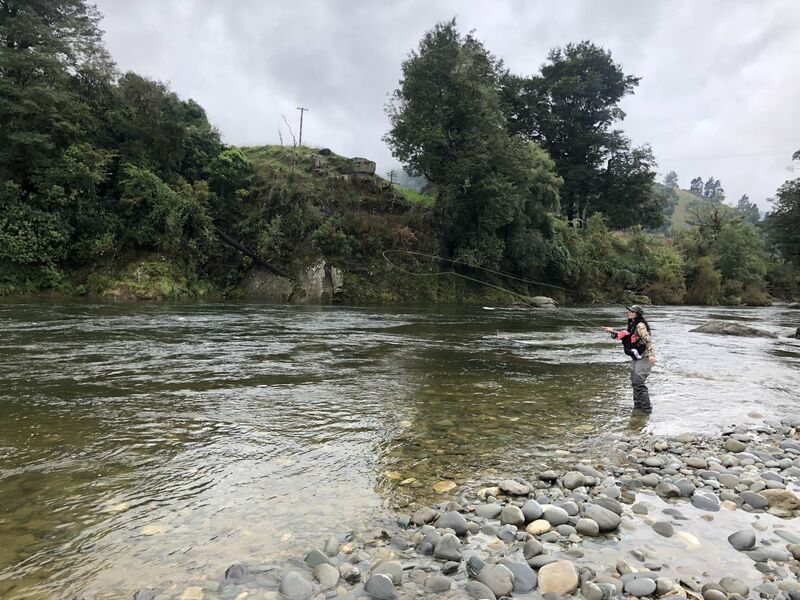 Vokey and her equally outdoorsy husband took a trip to the South Island of New Zealand to fly fish earlier this year when Adelaide was three months old. There, Vokey says, “there are enough sandflies to carry a person away.” How she dealt with biting insects speaks volumes about the challenges fly-fishing moms face. Mothers share tips with each other as we learn through trial and error. April and Adelaide by the banks of the river. I argue that fly fishers are inherently suited to meeting the challenges of marrying the sport with motherhood. We are the Scouts of the water and derive a certain exhilaration from meticulous preparation. Fly fishers think of contingencies: an assortment of flies, clothing if the weather turns, food and drink we might need, what to do if we encounter dangerous animals and first-aid skills that could save us. Then we pare back superfluous gear. It’s an identical skill set to any parent preparing for an outing. Both Walter and Vokey speak of their desire to raise children who cherish time spent outdoors. So far, the signs are positive, although a four-month stay in British Columbia this summer at a cabin without electricity or running water will prove the ultimate test for Vokey and her baby. Mothering on the water is more complicated than on land, but adaptability is still prized and the emotions of occasionally feeling as if you’re facing insurmountable odds resonate. If the presence of women in fly fishing is to become mainstream, the sport’s culture will have to become comfortable with motherhood. Guides, associations and lodges will need to reconcile that female clients will include pregnant women, moms and babies. Outfitters, meanwhile, stand poised to capitalize on a gap in the market for mom-and-baby gear. We bother persevering because fly fishers can be obsessive, seasons can be short and life feels incomplete without time on the water. Fly fishermen use flies, instead of bait or lures, that imitate insects to persuade the fish to strike. Purists even tie their own flies. Fly fishermen are therefore focused on entomology and seasons. They are often hip-deep in the water they’re fishing; hence the most recognizable of the fly-fishing equipment: a set of ungainly if highly serviceable waterproof waders. For women and men, fly-fishing means remote locations and a lot of gear. It is not a recreation for the indolent, although to aficionados of the sport, an accurate cast can be as much art as exercise, and usually more satisfying. And always, there is the Zen of the endeavour: The light-weight beauty of the fly, the skill of the cast, the thrill of the catch and of course, the peacefulness of the surroundings.